Papaya alegre is a term used in Latin America, when fresh orange juice is put onto fresh papaya to make it taste better. Earlier on, I described a trick of mine to bath a fruit salad in its own juice if I wanna make it taste more intensive. Well, for papaya I have a similar trick. Sometimes the papaya I buy in the shops does not live up to the best if tried (it is still great, or plaine papaya is not what I want to eat. In that case, I mix a bit of the papaya (around 30g) with an equal amount (in weight) of banana and goji berries. The trick is to allow the goji berries to soak in 3 soup spoons of water and 2 soup spoons of tequilla for 15 minutes before use. Discard the liquid afterwards or use it for shots. 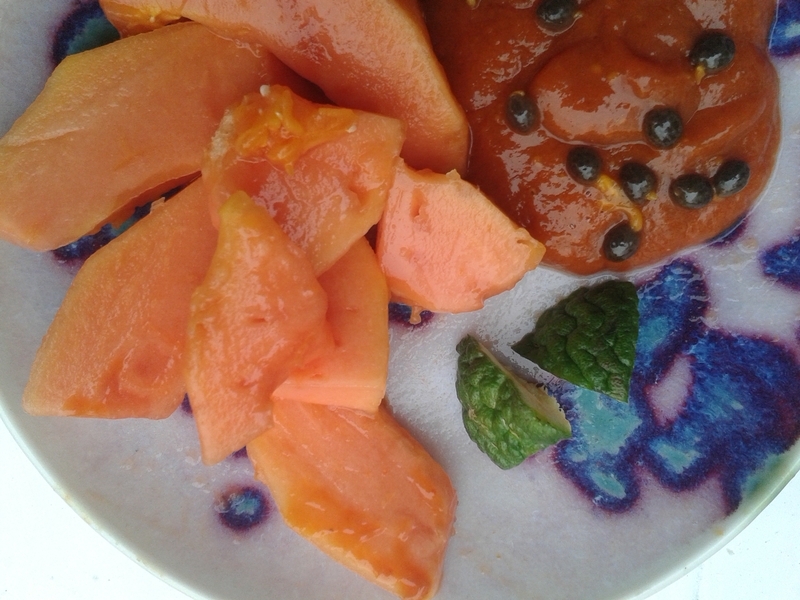 Mix papaya, banana and soaked goji berries – Voilà! Attention the sauce doesn’t stay fresh for more than one day, so eat it! Next PostEat luxurious caviar and save the sturgeon: Vivace Caviar! !